Katrina vanden Heuvel joins Sonali Kolhatkar on Uprising Radio to discuss the unfolding crisis. Friction between Russia and the West remains high as Ukrainians prepare for a presidential election scheduled for May 25. Russia has mobilized as many as 40,000 troops along Ukraine’s eastern border and NATO is making moves along Ukraine’s western border. Pro-Russian demonstrators have seized government buildings in several towns in Eastern Ukraine—Kharkiv, Luhansk and Donetsk—and de facto government in Kiev is calling for United Nations peacekeepers to intervene. The Nation’s editor and publisher Katrina vanden Heuvel joined Sonali Kolhatkar on Uprising Radio to discuss this unfolding crisis. “We are witnessing civil war,” vanden Heuvel says, one that was “triggered by the European Union’s reckless ultimatum—despite Russian President Vladimir Putin’s offer of a tripartite agreement—which compelled an elected president of a deeply divided country to choose economically between the West and Russia.” She says that a cooling of tensions is still very much within the realm of possibilities, but cautions that peace has its preconditions. 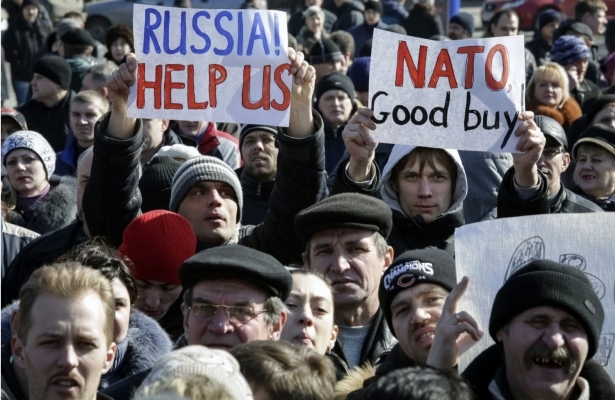 First, diplomacy between Ukraine, Russia, the US and the EU needs to proceed in good faith. Additionally, all Ukrainians must be fairly represented in the upcoming presidential elections—and Kiev must take seriously the idea of granting more autonomy to regional administrations.